Staj Krampouezh/ Learning to make crepes. We all know how to make crepes, don’t we? Or so you think. You may think you can make pancakes until you come to Brittany and try them out here. Pancakes are the national dish here. You find crepes everywhere, and there are usually crepes served for most social events. Breton people have raised crepe making to an art. 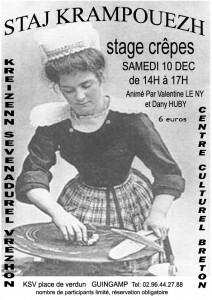 You will understand that when I received this offer for an afternoon to learn how to make crepes, I took the opportunity. I am now looking forward to learn this ancient art. Author EmmanuelPosted on 9 December, 2011 Categories BrittanyLeave a comment on Staj Krampouezh/ Learning to make crepes.